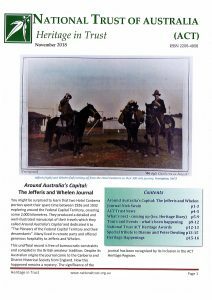 This issue’s main article covers the journal written by two local explorers of the ACT and the region, George Jefferis and John Whelen. There is also a report on this year’s National Trust Heritage Award results and a special tribute to long-time members Dianne and Peter Dowling. Click on the front cover to enjoy this issue.